After recent binge-eating, J and I decided to go for a detox meal at Mana, the new slow food restaurant in Sheung Wan which opened in February 2012. Unfortunately, we had been told that the waiting time would be 30-45 minutes around lunchtime as the restaurant was massively popular, so we opted for Life Cafe in Soho instead. 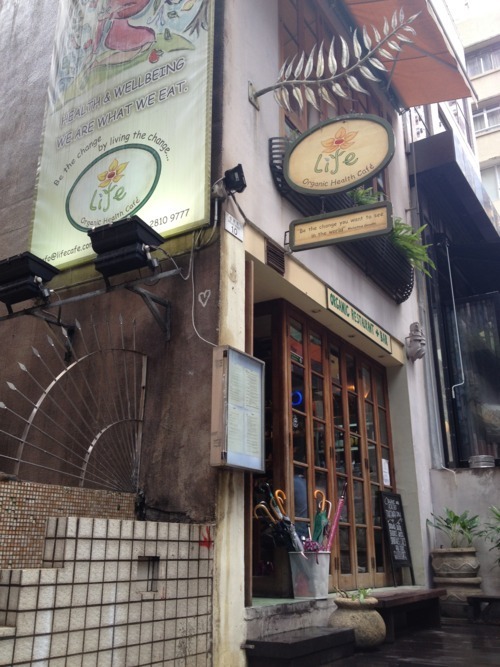 Life Cafe specialises in organic and vegetarian food, which, gladly for us, seemed healthy enough for our purpose! It also now has a new takeaway location in Wanchai (50 C Johnston Road, across from Ovo on Ship Street), if that is more convenient for you. J and I ordered from the à la carte menu initially, and we shared the Mushroom Pizza ($98) with shitake and button mushrooms, mozzarella cheese, roasted garlic, fresh thyme, lemon zest, truffle oil and rocket and the Black Bean Quesadilla ($98) filled with veg sausage, cheese, grilled eggplant, caramelized onions, carrot and tomato lime. (1) The mushroom pizza was quite average. Even though the mushrooms were moist and had deepness in their taste, the crust was too dry and was slightly burnt. I could hardly taste the truffle oil – it wasn’t actually a big problem since I didn’t come here for a luxury-laden meal, but I just dislike it when restaurants say “truffle oil” on the menu to entice you and then fail to deliver… Most importantly, the portion was rather ungenerous for its price. (2) The Quesadilla (a Mexican dish with tortilla filled with cheese and other ingredients), on the other hand, was fantastic, and had lots of stringy cheese and other delicious fillings! The veggie sausages had a particularly pleasant chewy texture, which led J and I into a round of discussion about vegetarian meats. Apparently, Taiwan has lots of good vegetarian meat products these days and the government is really supportive to the industry! 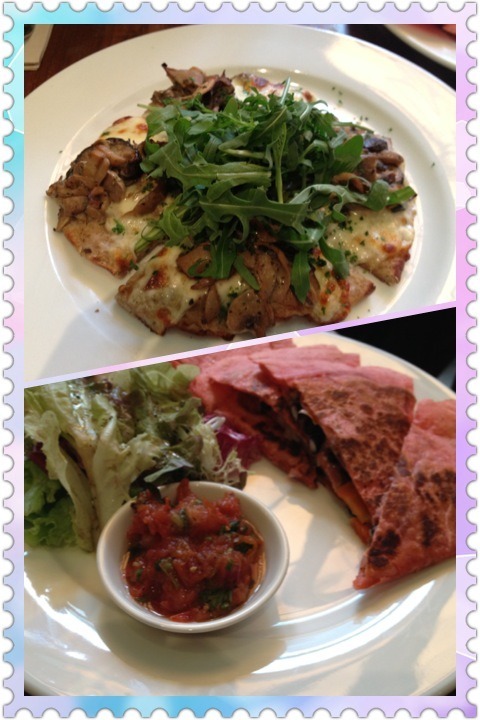 It could possibly be our problem, but we were really hungry after finishing the mushroom pizza and quesadilla, so we had to order another Set Lunch ($109) to share between us! (3) The set lunch actually had much larger portions than our a la carte dishes. 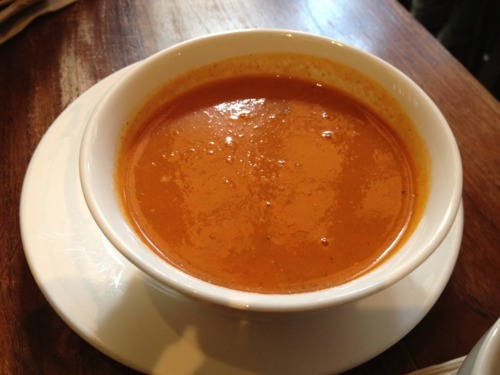 It started off with a wholesome Pumpkin Soup, which had its flavours enhanced by a subtle taste of cumin. (4) Then, we had the stir-fried rice vermicelli, which had a variety of veggies in it and was awesomely flavourful even though there was no meat at all! I particularly liked the cherry tomatoes and the baby corn as they were firm and crisp and were a nice contrast to the soft rice vermicelli. (5) We also got a Tea/Coffee and a piece of Organic Cookie as part of the set lunch! 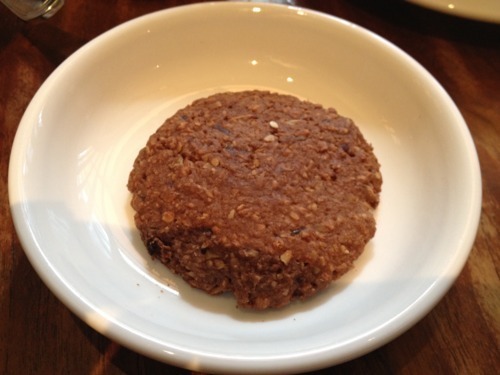 I loved the cookie as it had lots of nuts and oatmeal bits in it, giving it more of an interesting texture than plain butter cookies. 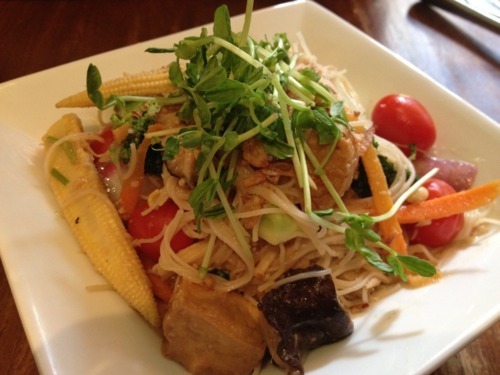 Conclusion: Life Cafe is the perfect haven for a mid-week detox. The portions were too small for me, but the tastes were consistently good! Life Cafe also has a nice bar on its patio on the 3rd floor, if you are an al fresco person!